25 February 2014 – The West Cheshire Credit Union – which provides local residents with affordable saving and loan products – will opened its doors on Ellesmere Port’s Whitby Road in April. The first shop to be opened by the Union, which had previously been based within Ellesmere Port market and Trinity Church, the organisation can now benefit from being located on the high street, close to the Citizens Advice Bureau. 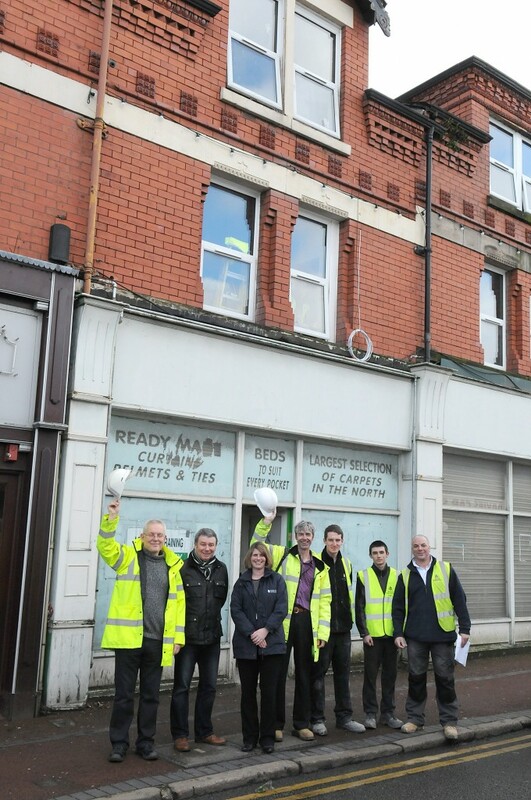 Relocating to 13 Whitby Road as part of the Council’s Empty Shop Refurbishment Scheme, the Union will benefit from a two year peppercorn rent from landlord Access2Training&Employment, which bought the property and is currently refurbishing the shops and creating six affordable flats above. The Credit Union will be the latest in a long list of successful new ventures being attracted to the Whitby Road High Street following prioritisation by Cheshire West Council and the Ellesmere Port Development Board. Neil Jay, Manager of West Cheshire Credit Union, said: “Working with Jochem and Gary we have managed to find a suitable location for our very first shop front. This is a major step forward in the development of West Cheshire Credit Union and will bring our business into the public eye. “We have already discussed as part of our plans to display essential electrical goods in the shop front making an affordable option to the weekly payment stores in the town. The Credit Union will now benefit from a highly visible shop frontage on a busy road with a self contained shop and office where it can help to offer a real alternative for residents to high-interest money lenders and loan sharks. The Council’s Ellesmere Port Locality Team is supporting a local awareness campaign to highlight the dangers of illegal money lending offers. Councillor Lynn Riley, Executive Member for Localities, said: “Illegal lenders prey on residents who often only want to borrow a small amount of cash, and high-interest loans can often spiral out of control if the first payment is missed. “We want West Cheshire residents struggling with debt to know that there is an alternative. West Cheshire Credit Union, a non-profit making organisation, can be a lifeline to struggling residents and ploughs money straight back into the community. Gary Williams, Project Manager of Access2Training&Employment, and landlord of 13 Whitby Road, said: “It is a real pleasure and honour to have the West Cheshire Credit Union taking the tenancy of 13 Whitby Road on a peppercorn rent. As a community interest company we are committed to working for the benefit of our local community, ideals that the credit union is also committed to. Local member, Councillor Justin Madders, said: “This is excellent news for both the credit union and the high street. The easy credit and pay day lenders that proliferate the high street will no longer have it all their own way- the credit union will offer an ethical alternative now.